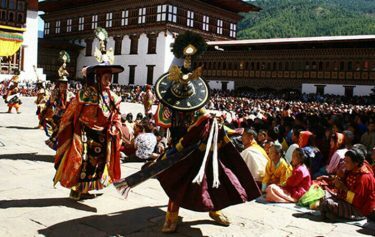 Bhutan festivals and culture tour is arranged to experience the most colorful and dramatic events of Bhutanese culture. You will be guided by our expert Bhutanese guide for visiting the villages, valleys, historic sites and spectacular dzongs which are traditionally and culturally rich. 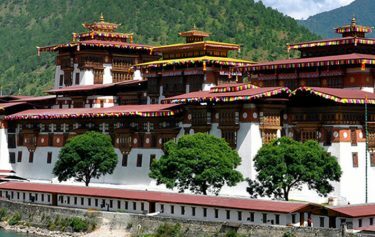 This trip offers an intimate view of life in Bhutan along with visit to various astounding architectural monuments like dzongs and monasteries. We will visit most amazing sacred places and festivals of Bhutan. 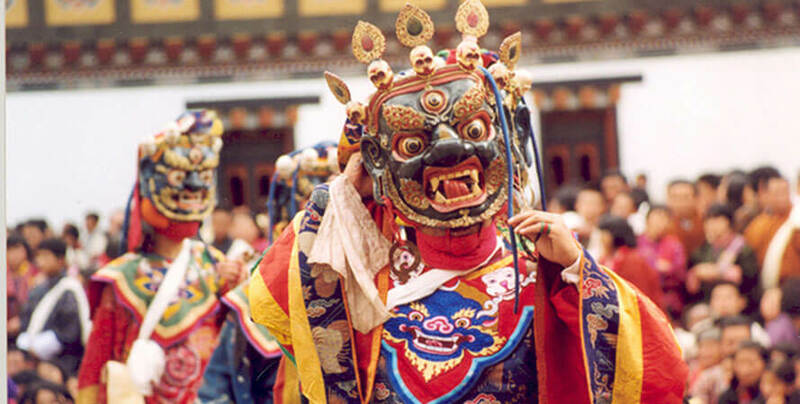 Festivals like Tsechus is one of the most ideal approaches to encounter the antiquated living culture of Bhutan performed by monks in colourful and elaborate costumes. In this festival tour and culture tour we visit numerous popular Bhutanese Tsechus like the Thimphu Tsechu, Paro Tsechu, Punakha Tsechu, Jambay Lhakhang Drup and Bumthang Ura Tsechu. Discover Paro city, including the Drugyel Dzong, now in ruins, built to commemorate the victory of war against the Tibetan invasion. Visit Kyichu Lhakhang, one of the holiiest and oldest temples in Bhutan. This temple, built in the seventh century A.D., dates back to the time of the Tibetan King Songsten Gampo. 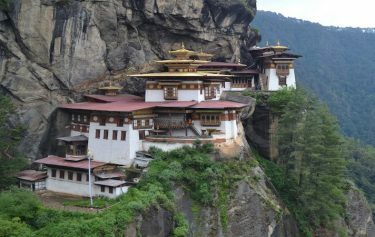 You also visit the National Museum and the Paro Rimpung Dzong, Enjoy a morning hike to Taktsang, the famous “Tiger’s Nest” Monastery, a very sacred monastery built in the 17th century in memory of Guru Rimpoche. 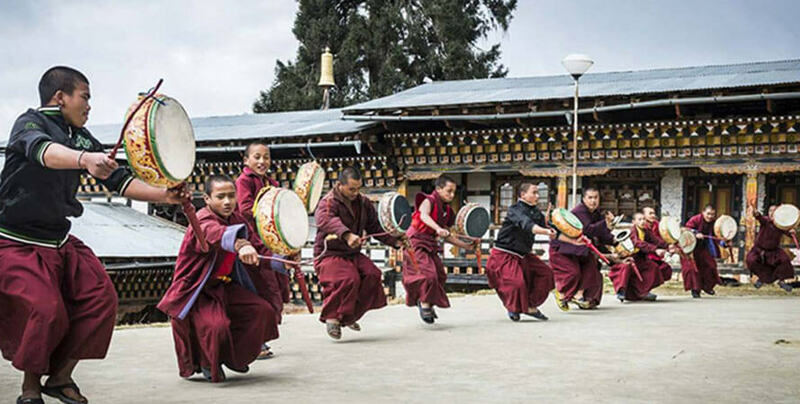 Enjoy the colorful dances of the Thimphu Tsechu Festival. 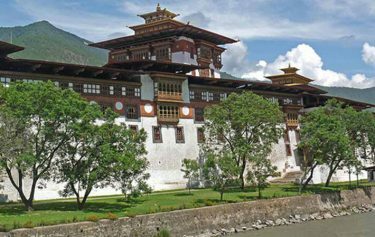 Visit Thimphu’s local sights such as the National Library, established in 1967 to preserve many ancient Dzongkha and Tibetan texts, Tashicho Dzong, the main Secretariat building, and Zelukha Nunnery. Visiting sites around Bumthang and witnessing the Bumthang Festival at Tamshing Monastery. Day 1: Fly on Druk Air to Paro. During this journey, you will experience breathtaking views of the Himalayan ranges including Mt. Jichu Drak and Chomolhari. 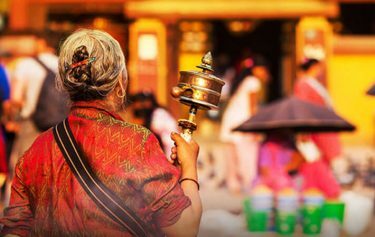 After your arrival in Paro, you will be welcomed by your guide at the airport and then transferred to your hotel, where you will have a briefing by your guide. You will have the afternoon and evening free to rest or walk around Paro (7,380 ft.) and savor the feeling of a country that seems to be existing in an earlier century. From the dress of the people to the traditional architecture, you know you are in a different kind of place than exists anywhere else on earth. You will be amazed at the fresh, clean air and peaceful environment. Overnight at local lodge or hotel. Spend a full day on a guided tour of Paro including the Drugyel Dzong, now in ruins, built to commemorate the victory of war against the Tibetan invasion. Afterward, visit Kyichu Lhakhang, one of the holiiest and oldest temples in Bhutan. This temple, built in the seventh century A.D., dates back to the time of the Tibetan King Songsten Gampo. You also visit the National Museum and the Paro Rimpung Dzong, both very unique and beautiful structures. 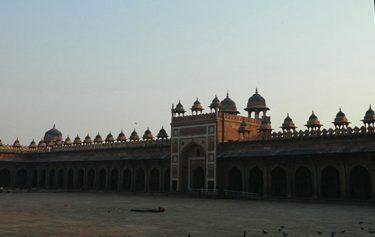 The museum houses an exceptional collection of art and ceremonial objects. Return to your hotel for dinner and overnight. Enjoy a morning hike to Taktsang, the famous "Tiger's Nest" Monastery, a very sacred monastery built in the 17th century in memory of Guru Rimpoche. The monastery is now rebuilt after a disastrous fire in April 1998. This is a fairly vigorous hike and the trail may be a bit muddy. If you are unable to make the hike, we can hire a pony for you to ride, or you can view the monastery from the road below. After lunch, drive about two hours to Thimphu (7,710 ft.) for your overnight. Thimphu is a charming town that sits in the heart of the Himalays. Thimphus developement is strictly monitored and buildings cannot exceed a certain hight nor can they be designed in anything but the traditional Bhutanese style. 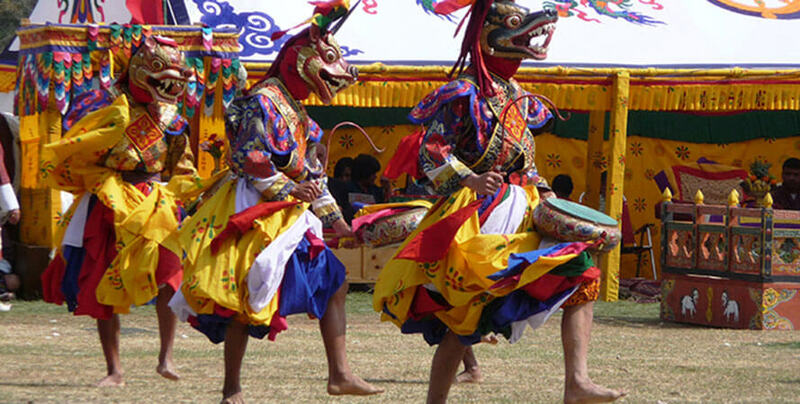 Enjoy the colorful dances of the Thimphu Tsechu Festival. This is a festival in honor of Guru Rimpoche and is highlighted by 12 events of the Buddha Sakyamuni's life. 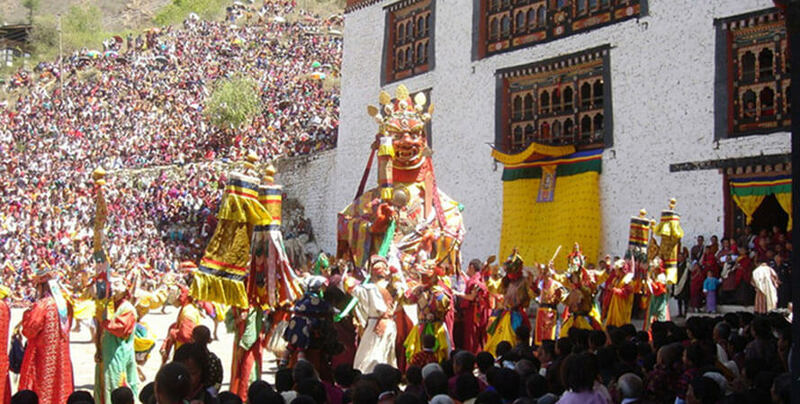 The dances are performed by monks as well as lay people taking on the aspects of wrathful and compassionate deities, heroes, demons, and animals. Enjoy another day at the festival. Time permitting, visit Thimphu's local sights such as the National Library, established in 1967 to preserve many ancient Dzongkha and Tibetan texts, Tashicho Dzong, the main Secretariat building, and Zelukha Nunnery. A great way to see local life up close is by taking a stroll to the weekend market. Here, the residents of Bhutan gather in Thimphu to sell their vegetables, traditional masks & textiles, incense and jewelry. In the morning, drive to Trongsa (7,215 ft.), a 7-8 hour drive to the center of Bhutan across the Dochu-La & Peli-La passes from where one can enjoy the sight of the Himalayan Peaks on a clear day and the forests with their many different species of flora. Along the way, stop for lunch at Chendebje Chorten, a stupa with eyes similar to Buddhanath stupa in Nepal. Overnight at a hotel in Trongsa. After breakfast, visit Ta-Dzong, the most impressive dzong in the kingdom and possibly one of the most aesthetic and magnificent works of traditional Bhutanese architecture. Afterwards, you will drive to Jakar, the major trading center of this region. If you have time, you may wish to walk along the road in the beautiful surroundings for part of the way. This four-hour drive will be across the Yotong-La Pass at an altitude of 11,685 feet and down the Chumey valley until you finally arrive in Jakar for your overnight. Enjoy an afternoon of sightseeing in and around the Bumthang area. 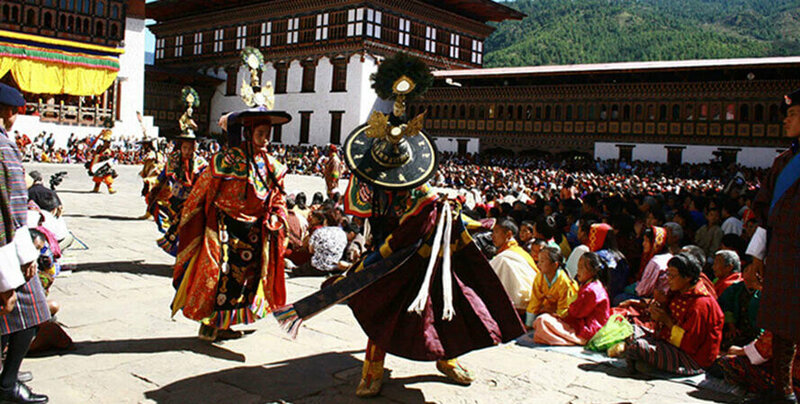 These two days will be spent visiting sites around Bumthang and witnessing the Bumthang Festival at Tamshing Monastery. 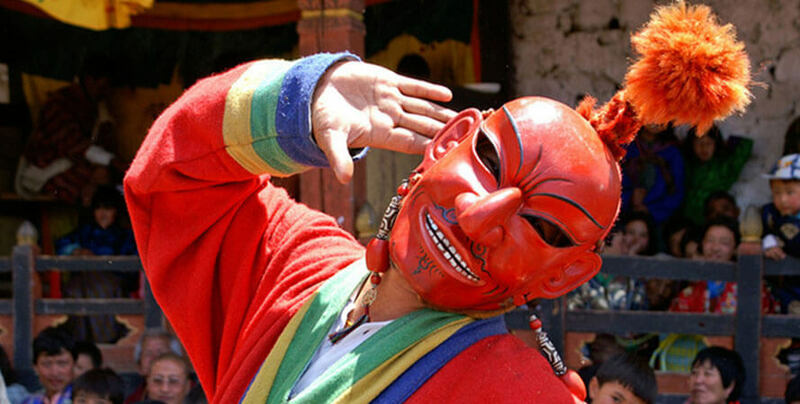 The festival is celebrated in honor of Pema Lingpa and you will have the rare opportunity to watch the mask dances performed by the monks of the monastery. This is a much smaller monastery and festival than the one you saw in Thimphu, but the monk-dancers are spirited and the setting is wonderful. During your stay, you may also be able to see a thangkha unveiling at another monastery. Overnights in a local hotel. Drive to Punakha. Overnight at hotel. Drive back to Paro, Overnight at hotel.